It's Modig again, all smartly hand printed and painted, ready to be incorporated into the Christmas story illustrations. He’s been printed on cream watercolour paper, using black Speedball ink. For colour, I used Daler-Rowney's FW Acrylic Inks. These inks are fantastic – I’ve been using them for years now as an alternative to traditional watercolours. They have very strong pigment, are highly colourfast, and once dried, are waterproof. My printing press makes me so happy! It produces perfect results every time, whether printing on paper or fabric. So simple and easy to use. Alas, there doesn’t appear to be a maker’s name on it, but it was made in Germany I think. (I’ve just had a look on ebay and there is one for sale on there for £244, which is well worth it I would say). If you have noticed that Modig’s head is facing a different way, that’s my new time-saving idea! 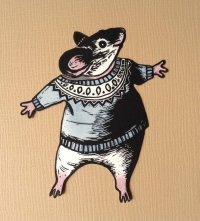 Instead of carving a whole new lino-cut, I printed him a different head from another mouse, so that he can now look up at the Christmas tree in illustration number 1. My plan for the illustrations is to use a variety of different techniques including coloured papers, painted backgrounds, and of course the lino-cut characters. I’ve no idea if it will all work properly, as I’ve never done anything similar before, so I’d better just try it and see!